Tommy Tanner has quite the extensive soccer resume – a resume he will add to this year as the General Manager of Utica City FC. 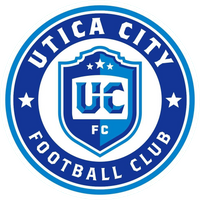 Tanner, a retired American soccer midfielder, comes to Utica City FC with a plethora of soccer experience as a player, coach, and general manager. A native of Syracuse, Tanner began his playing career at North Carolina State University, where he made it to the NCAA Final Four during his senior year. After graduating, Tanner was drafted in the first round of the MISL (Major Indoor Soccer League) by the Cleveland Crunch; he received Rookie of the Year honors in his first season of play. Tanner would go on to win three championships with Cleveland in the NPSL (National Professional Soccer League). Tanner’s next stop was the Rochester Rhinos of the USISL A-League, where he played for 8 years and was a captain for several seasons. Tanner would win four more league championships with the Rhinos, including a US Open Cup Championship. Shaw, a native of Northwestern England and graduate of Le Moyne College has experienced a successful collegiate and professional soccer career prior to joining Utica City FC. During his college playing career, Shaw was an NJCAA Division I National Champion, All-American, and a three-time MVP. He co-wrote the bestselling book 'Coaching Outside the Box: Changing the Mindset in Youth Soccer' with U.K. sport scientist Paul Mairs; and this material has been endorsed throughout the world, including recognition in various national coaching curriculums. Shaw is also a commentator for Division I college soccer on ESPN and has developed several initiatives and programs to help develop youth soccer throughout the U.S.